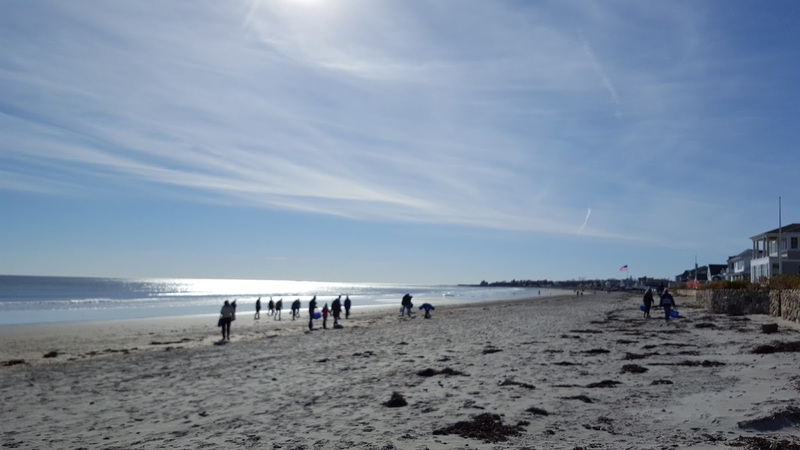 Join us for our monthly beach cleanup this Saturday at Jenness Beach in Rye, NH! Please arrive by 10:30 AM as we will start promptly at that time. All supplies are provided. During the cleanup, we'll use data cards to track our findings. Please dress in layers and wear sturdy shoes, as it's usually windier and 10-15 degrees cooler on the beach than it is inland. Free parking is available in the parking lot. Please RSVP to info@blueoceansociety.org or by calling 603-431-0260. Hope to see you there! Thanks to GXT Green for sponsoring the cleanup! 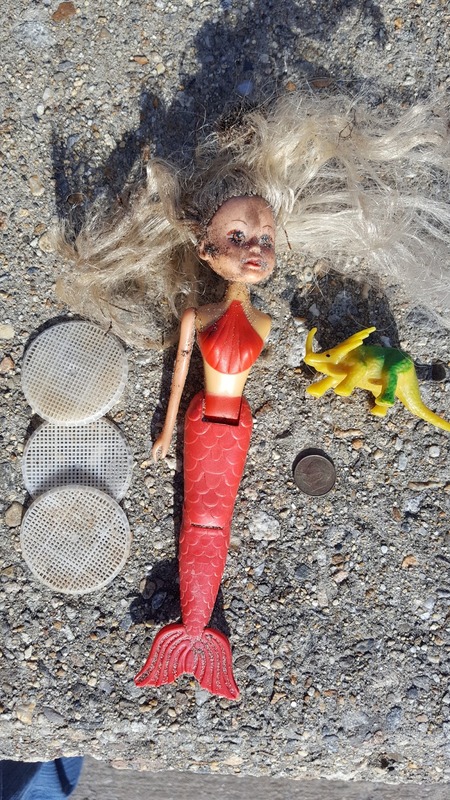 Interesting finds at the cleanup: 3 disks from the Hooksett wastewater treatment plant spill on 3/6/11, a toy mermaid, toy dinosaur and a dime! 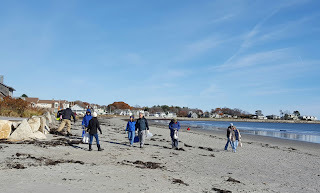 On Saturday, November 12, 52 volunteers headed out for a cleanup at Jenness Beach. 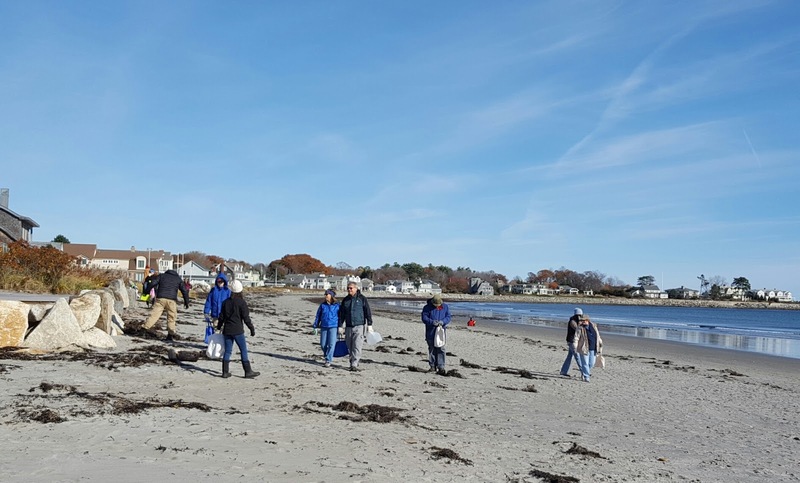 At first glance, the beach appeared fairly clean, but volunteers ended up collecting over 800 pieces of litter, totaling 43 pounds! During the cleanup, volunteers used data cards to record their findings. Some of the other items noted included a crayon, a mermaid, a dinosaur, a shotgun shell, a pen, 3 tennis balls, a pair of socks and 2 plastic knife handles. Thanks to the volunteers from UNH Alumni, Green Team at Oyster River Schools and everyone else who joined us! Want to Help with our Microplastics Project? Join a sorting team! At the beach, it's easy to see litter items like bottles, cans and bags. But there are smaller plastics that may go undetected. 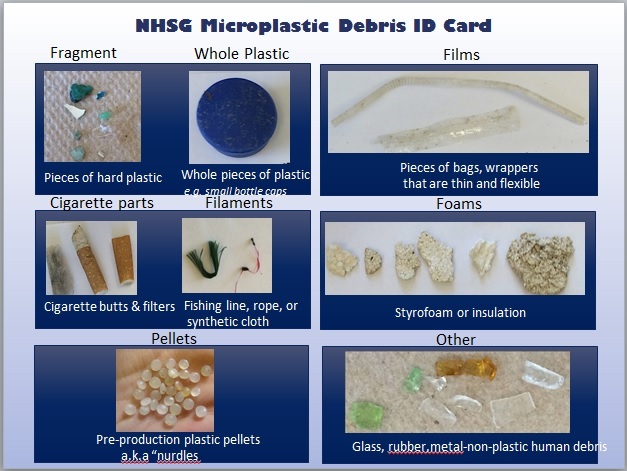 We wondered how many of these microplastics were on our beaches and we have been working with New Hampshire Sea Grant (NHSG) to find out. From April through October, we went to five NH beaches once per month to look for microplastics (plastics between 1-5mm in size). The beaches were several of our most popular local beaches: Wallis Sands, Jenness Beach, Hampton Beach, Hampton Harbor and Seabrook Beach. During the sampling process, we sifted the top layer of sand in a one meter squared plot. The samples were bagged, and now it's time for the fun part: sorting! During the sorting process, we separate organic and inorganic material, then sort the inorganic material into several categories: foams (Styrofoam or insulation pieces), fragments (hard plastic pieces), films (e.g., straw wrappers), filaments (e.g., pieces of synthetic rope or fabric), plastic pellets ("nurdles"), and cigarette parts. The process is a bit tedious, but yet oddly relaxing. If you'd like to help, we have several sorting dates coming up. Sorting will occur in Portsmouth, but space is limited so please RSVP and we can provide location and directions. All supplies are provided and we'll do a brief orientation onsite. If you'd like to join us, e-mail Jen at jen@blueoceansociety.org or call 603-431-0260. Hope to see you there! We estimate over 700,000 fibres could be released from an average 6 kg wash load of acrylic fabric. - Napper, I.E. and R.C. Thompson (2016, In Press). Helping the ocean starts with changing our clothes. The startling quote above was from a recent article in Marine Pollution Bulletin. It adds to the growing body of work showing that even the clothing we wear can impact the ocean. 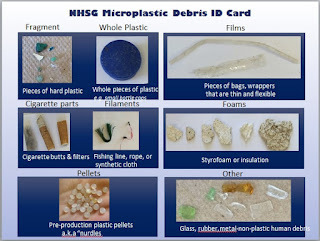 For the past few years, we've been studying microplastics with New Hampshire Sea Grant. Microplastics are plastics less than 5 mm in size. They come from a variety of sources, including the breakdown of larger plastics. They can also come from our laundry. As we wash fabric, fibers flake off and get discharged in the machine's wastewater. It’s unclear what happens to the particles after that. Some get trapped during the wastewater treatment process, while others enter a local waterway during the discharge process. While we don't fully understand this problem, recent studies show the impacts could be enormous. As mentioned above, washing acrylic fabric could produce up to 700,000 acrylic fibers during one load. Patagonia commissioned a study that found that washing synthetic jackets released on average 1.7 grams of microfibers per load. 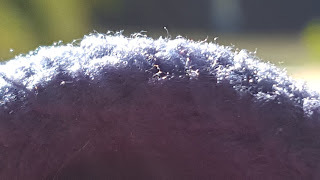 In Slovenia, scientists estimated that if each resident used a fleece blanket (washed 4 times per year) and a fleece jacket (washed 8 times a year), they’d result in the emission of 317 pounds of synthetic fibers into the environment each year. And these are tiny fibers that don't weigh much individually! In that study, scientists found that tumble-drying resulted in a release of fibers 3.5 times higher than washing. So, there's one more reason to feel good about hanging your wash on the line. Microplastics can be eaten by all members of the food chain, from tiny zooplankton to large whales. In enough concentrations, plastics can hinder the ability of marine animals to function through hindering their ability to eat, blocking digestion or leaching chemicals into tissues. We know crabs, mussels and fish eat microplastics. It doesn't take a huge leap to wonder about the effect of plastics on our own health if we eat these organisms. Unfortunately, the impact doesn’t stop there. Microplastics can also host pathogenic bacteria and other pollutants that further contaminate waterways. It’s an odd thing that we outdoorsy people, who can really benefit from synthetic fibers such as fleece and moisture-wicking garments, add to the litter problem every time we do a load of laundry. As an organization, we’re trying to reduce our impact. This has included switching our Blue Ocean Society apparel to more eco-friendly organic cotton. We also distributed organic cotton t-shirts instead of synthetic fabric running shirts at our Run for the Ocean 5K in June. We’ve also been studying the prevalence of microplastics on the New Hampshire coastline. Look at labels. 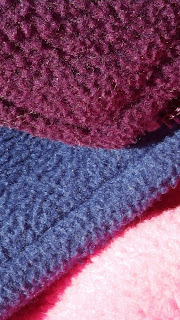 Use clothing and bedding made of natural fibers such as cotton, wool, linen and hemp whenever possible. Wash synthetic fabrics less frequently if possible, and air dry them. Help us learn about microplastics on local beaches by volunteering to collect or sort sand samples. Join a beach cleanup or conduct your own. Pick up tiny trash! Bråtea, I. L. N., Eidsvolla, D.P., Steindalb, C.C. and K.V. Thomas. 2016. Plastic ingestion by Atlantic cod (Gadus morhua) from the Norwegian coast. Marine Pollution Bulletin 112(1-2):105-110. Bruce, N., Hartline, N., Karba, S., Ruff, B. and S. Sonar. Microfiber Pollution and the Apparel Industry. 2016. (Online). Patagonia/Bren School of Environmental Science and Management. Mathalon, A. and P. Hill. 2014. Microplastic fibers in the intertidal ecosystem surrounding Halifax Harbor, Nova Scotia. Marine Pollution Bulletin 81(1):69-79. Napper, I.E. and R. C. Thompson. 2016. Release of synthetic microplastic plastic fibres from domestic washing machines: Effects of fabric type and washing. Marine Pollution Bulletin 112(1-2):39-45. O'Connor, M.C. 2014. "Inside the lonely fight against the biggest environmental problem you've never heard of." The Guardian. Pirc, U., Vidmar, M. , Mozer, A. and A. Kržan. 2016. Emissions of microplastic fibers from microfiber fleece during domestic washing. Environmental Science and Pollution Research. Note: this article first appeared in print in Blue Ocean Society's Fall 2016 edition of Sea Notes.